Apples and cranberries are both autumn icons. So why not set them up for a date? 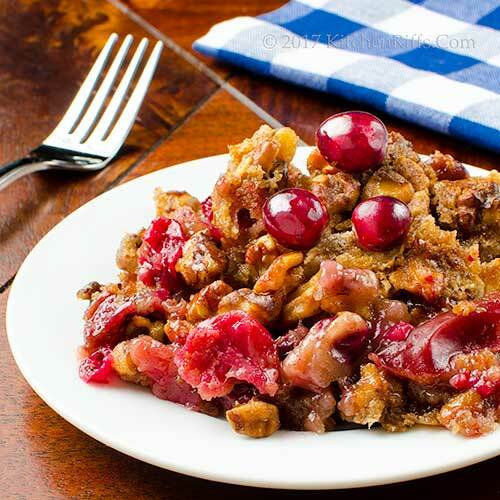 They get along beautifully in this dish: Cranberry ting enlivens apple mellowness. And baking concentrates their flavors, bringing out the best in both. With Thanksgiving coming up soon, you’ll want to add this dish to the menu. Your guests will gobble it up. Crisps (called crumbles in the UK and Australia) are similar to cobblers. But instead of using a biscuit topping, a crisp typically is topped with streusel – a crumbly mixture of butter, flour, and sugar. This crisp recipe is adapted from one that appeared in the November 2001 issue of Bon Appétit. The original recipe called for adding uncooked oats to the streusel topping. But Mrs. Kitchen Riffs – the dessert maven in our household – prefers to use walnuts instead (an idea she also used in our recipe for Walnut Apple Crisp). We think nuts provide better texture, and richer flavor. Prep time for this recipe is about 30 minutes. Baking adds another hour or so. You may also want to let the crisp stand for at least 30 minutes before cutting, so it has time to firm up. This dish serves 8 to 10. Leftovers keep well for a few days if refrigerated in an airtight container (you can also freeze them, in which case they will keep for at least a month or two). Peel the apples or not? We usually don’t. The peels add extra flavor and texture, which we like. But peel away if you wish. What type of apple to use? Whatever you have on hand. If you have a choice, though, it’s best to use apples that retain their shape and texture when baked. We used a mixture of Gala and Golden Delicious. BTW, Golden Delicious apples are very different from their similarly named red counterparts. Goldens have much more flavor and savor. The red variety? Kinda blah, in our opinion. A traditional streusel topping contains only flour, butter, and sugar (plus maybe some spice). It’s tasty stuff, but doesn’t have enough structure to hold its shape on top of the apples as they soften during baking. That’s why many recipes for crisps call for adding oats – they add texture to the streusel. But they don’t add much flavor. So we prefer chopped nuts, especially walnuts or pecans (either goes well with apples). They’re tasty and attractive, and retain their shape when baked. Baking powder loses its potency over time, so check the expiration date. We replace ours once a year, buying fresh baking powder when the time changes in the autumn (this helps us remember to do it). We always use kosher salt for cooking/baking. Because kosher salt is more coarse than regular table salt, it’s less salty by volume. If you’re using regular table salt, start with about half as much as we specify. We often serve this dish neat, without garnish. But whipped cream and vanilla ice cream both make dandy additions. Or you can add a few cooked cranberries: Heat the cranberries in a small saucepan, adding some sugar to glaze them (and sweeten them – cranberries are pretty tart on their own). “You’re a berry good baker,” I said. “And you’re an apple polisher,” said Mrs K R.
Great idea -- crumble/crisp/cobbler/buckle/slump/pandowny..... Whatever you call these fruit things they are marvelous! I've made very similar ones to this, with either oats or nuts. I like to mix apples that stay firm with the ones that mush up, for a contrast in textures. ALL GOOD! Hi Mae, don't you love all the different names for baked fruit desserts? I can't decide if slump or grunt is my favorite. :-) Thanks for the comment. Love that it only takes 30 minutes to prep and those beautiful cranberries on top! Hi Ashley, take less time than that to eat, though. :D Thanks for the comment. Hi Laura, hard to go wrong with an ice cream hat on any dessert. :-) Thanks for the comment. I can't get enough of the apple cranberry combo! This looks SOOOO good! Hi Kelise, it's a great combo of flavors, isn't it? Love it! :-) Thanks for the comment. This is just the right flavors for fall and a simple dessert anytime. I love using the leftovers for yogurt or oatmeal topping too. Mmm. Hi Judy, great idea for how to use the leftovers! Thanks for the comment. Isn’t this a nice changed from Apple or blue wet crisps. I’m sure my family would love this. I love a good crisp (crumble) and wish I could get my hands on fresh cranberries. We only have dried cranberries at the moment which are delicious nonetheless. It's a great idea to add walnuts instead of the oats. Have a lovely day! Hi Vicki, bet they would! :-) Thanks for the comment. Hi Pat, it's for exactly that reason we decided to do this recipe! :-) Thanks for the comment. Hi Marcellina, fresh (or frozen) cranberries are SO good! Although dried ones can be nice, too. Thanks for the comment. Oh this is a dangerous thing to have around me. I can never have just one serving!! I love a good apple crisp. One with cranberries is even better. I don't usually peel the apples either, I like the peel just fine!! I can relate to the term 'crumble' since I live in Ozland most of the year. Good idea to add apples and a bit of orange juice to the recipe since cranberries can be quite tart. This is one of those dishes I can't stop eating once i get started! I've made a double crust apple cranberry pie and although it quickly disappeared, I like the idea of a sweet and crunchy topping instead of that second crust. 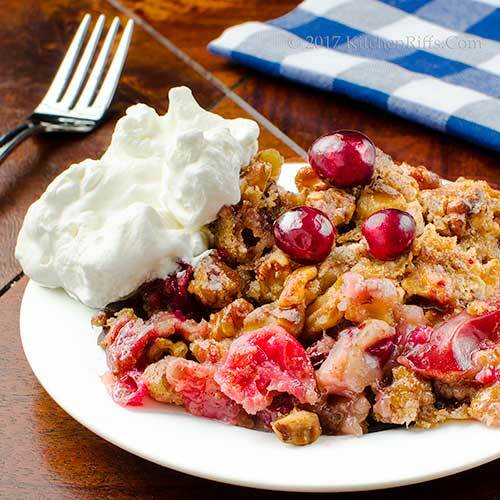 Cranberries are very tangy and would benefit from the streusel topping. And nuts in desserts are always a good thing. A wonderful autumn dessert! Hi Dahn, apple crisp IS awfully dangerous, isn't it? :D Thanks for the comment. Hi Fran, we can't stop eating it, either. Don't tell anyone, but apple crisp also makes a great breakfast. :-) Thanks for the comment. Hi Deb, the nuts really work well in this! Although I'd never say no to a double crust pie. :-) Thanks for the comment. Hi Charlie, you'd like a Thanksgiving dinner! Actually, much like a Christmas dinner, at least at our house. :-) Thanks for the comment. Nothing like a good crumble and this one looks very likeable! The crumble is always my favorite part. And that's the way the cookie crumbles! Hi Abbe, :-) The crumble is always my favorite part, too! Thanks for the comment. Anything with crumble and nuts is a WINNER in my book, John. This looks so tempting! Hi Angie, nuts are wonderful in a crumble topping! Great flavor, nice texture. :-) Thanks for the comment. Oh, my! 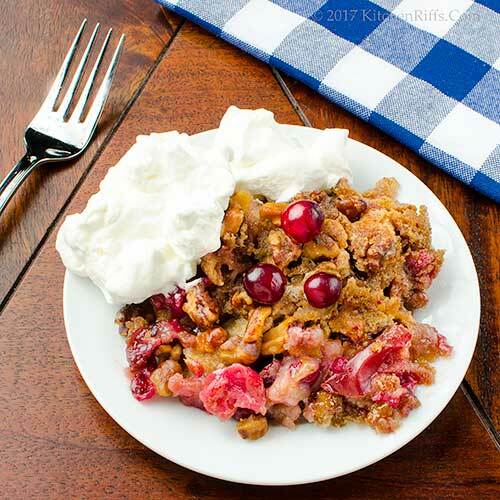 I am a fan of crumbles and this is perfect for the upcoming holiday. Easy and delish!!! Hi Denise, easy and delish speaks to us. :-) Thanks for the comment. THIS LOOKS LIKE A TOTAL HOLIDAY STAPLEEEEEEE!! I'm thinking I need to "borrow" this recipe.... For Thanksgiving this year! What a nice touch with the orange juice and zest! Cranberries are hard to find where I live, but I will definitely give your version of crisp a try. It looks wonderful! And it's so pretty! I like all kinds of apple desserts, but the humble crumble is one of my all-time faves. I've had mixed results using uncooked oats. Sometimes they're ok - sometimes they don't blend and are dry. Love the walnut substitution. Thanks for sharing this one. Pinning. Hi Gigi, you DO need to borrow this. :-) Thanks for the comment. Hi Lydia the OJ adds some nice flavor. As do the cranberries. :-) Thanks for the comment. Hi Jean, humble desserts are often the best, aren't they? Thanks for the comment. Hi Lea Ann, it was partially those problems that inspired Mrs KR to use nuts. Plus, they taste tons better! Thanks for the comment. Hi John, love these kind of dessert and I can't get enough of apple desserts, especially when they are made with cranberries. Well, this looks DElicious! Have always loved the combination of apples and cranberries, but I normally use the dried cranberries. Just love the look of the fresh ones. And that bit of orange is a great touch! Red delicous apples...I agree - why bother. :) Great dish Joh! Hi Gerlinde, love apple desserts, particularly at this time of the year. :-) Thanks for the comment. Hi MJ, we really need to try this with dried cranberries -- bet it'd be pretty good. Although the stores are full of fresh ones at this time of the year! Thanks for the comment. Am no good at tarts and pies, but I do so love crisps and this sounds delicious! Loving the citrus notes in there - the orange zest and juice makes this even more delectable! Here's hoping y'all enjoy many many helpings of this this weekend! Cheers! This is indeed a very festive dish, love to have it any time of the year. Thanks John. Hi Shashi, the citrus in this is really nice -- a fun touch. :-) Thanks for the comment. Hi Amira, this tastes just wonderful -- we should definitely enjoy it throughout the year, not just during the holidays. :-) Thanks for the comment. What a fantastic, homey, fall dessert. It could stand in for my usual, go-to apple crisp any time. Apples and cranberries are a match made in heaven and this crisp looks quite heavenly! Hi Jeff, homey desserts are the best! Thanks for the comment. Hi Chris, it is indeed heavenly. :-) Thanks for the comment. The cranberries do add a certain festive colour to this beautiful recipe. I just love the tartness that cranberries add too. Great tip about the salt. Hi Eva, I do like the color (and flavor!) the cranberries add. Good stuff. :-) Thanks for the comment. It looks perfect for the holidays... I love fruit crumbles. Hi Tricia, don't those two pair so well? Love them! Thanks for the comment. Hi Pam, agree fruit crumbles are terrific -- especially at this time of the year! Thanks for the comment. Hi Anne, you'll really like the walnuts -- tons of flavor and crunch. :-) Thanks for the comment. I'd eat that for dessert -- or breakfast! Looks addictive. Hi Carolyn, it's wonderful for breakfast. :-) Thanks for the comment. I could eat crisp and enjoy it thoroughly in comparison to pies. Adding a touch of zest would be such a good fresh additions. Looking so good. Hi Asha, crisps are really good! Hard to beat pie, but crisps do it. :-) Thanks for the comment. Hi Greg, silly mood? You'd fit right in at our place! :D Thanks for the comment. Looks delicious!! 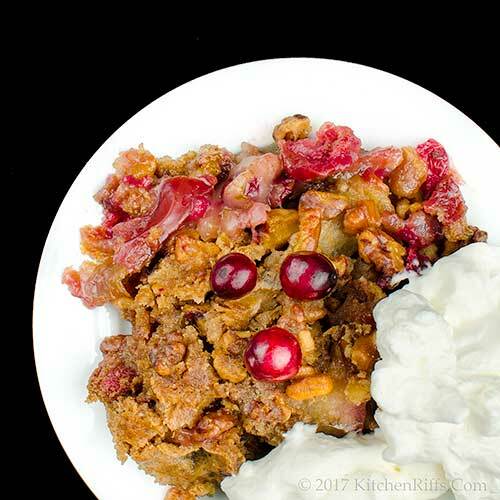 Great minds think alike as I just posted a cranberry apple crisp this morning! We love it and I like your addition of nuts. Hi Amy, it's a great dish, isn't it? :-) Thanks for the comment. Hi Raymund, this is a wonderful combo of flavors! :-) Thanks for the comment. I love a bowl of hot apple crumble on a winters night and it only gets better when cranberries are added to the mix. Stunning dish, I love it. Hi Emma, we love this hot, warm, or cold! Cold leftovers for breakfast. :-) Thanks for the comment. Perfect in every way! I love cranberries and they do add so much to just apples. And I love crisp - and it is also so much easier than pie! Hi Jamie, love pie, but agree crisp is SO much easier. And just as good -- better, really, with this nut crumble! Thanks for the comment. This looks sensational... love the cranberry apple combo. Hi Nisha, isn't this great looking? And tastes even better! Thanks for the comment. "Ting" is the perfect word to describe the flavor of cranberry, so thank you for that. I adore both apple crisp and cranberry, so this is for me. Hi Jeff, sounds like this dish is indeed for you. :-) Thanks for the comment.